The Sewers are a location unlocked by obtaining the Rusty Key after donating 60 items (artifacts or minerals) to the Museum. 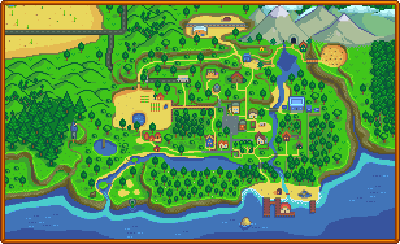 The Sewers can be entered either through the sewer cover in the south of Pelican Town or through the grates in the south of Cindersap Forest. Krobus is located here and sells rare items. In late-game Krobus can open a passage through the sewers to the Mutant Bug Lair, once players are on the quest Dark Talisman. Krobus always sells the Sign Of The Vessel statue, the Monster Fireplace, Void Essence, Solar Essence, and Void Eggs, as well as one Stardrop, one Crystal Floor Recipe, and one Wicked Statue Recipe. In addition, he will also sell a specific quantity of one other item every day. The Statue Of Uncertainty allows the player to change professions. After donating 10,000g, the statue requires the player to choose one skill to change. That night after the player goes to bed, the Level 5 "Choose a profession" screen will appear, followed by the corresponding Level 10 "Choose a profession" screen for the skill selected at the statue. In late game players will get the quest Dark Talisman, which sends them to speak with Krobus in the sewers. Once spoken to he'll open a passage inside the sewers to a new small area, the Mutant Bug Lair. Inside players can gather the talisman for their quest, catch unique fish (Slimejack) and fight swarms of bugs. The Sewers are where you can catch the Mutant Carp, which is one of the five legendary fish in the game. You can also catch Carp, Green Algae, White Algae, and Trash. 1.3: Added Statue Of Uncertainty. This page was last modified on 28 December 2018, at 20:08.